The majority of the runners mentioned that the Nike Air Zoom Terra Kiger 4 is very comfortable. The fit was just right for some runners who have tried the shoe. Several users admired the wider toe-box, which allowed their toes to move comfortably. The Terra Kiger 4 is a versatile shoe; not only did a few people use it for trail running, but also in the gym and as a casual shoe. The shoe provided enough amount of foot protection while running on the trail, said a few users. According to some comments, this running shoe offered great traction on varied surfaces. The mid-sole felt a lot softer compared to the previous version, based on a few comments. Most of the users mentioned that the Terra Kiger’s 4th iteration had reliable durability. According to some users, it ran half-a-size smaller than their usual running shoe size. A few were disappointed with the lace-loops that blew out easily after a few days of use. The Nike Air Zoom Terra Kiger 4 is a neutral trail running shoe that offers a combination of reliable traction, durability, and comfort. Generally, many users were impressed by the updates of this version. With all the technologies incorporated into the shoe, there is no doubt that the shoe is able to offer value for money. To set the stage for this review of the Nike Air Zoom Terra Kiger 4, I thought a little background would be helpful. The Kiger 4 is my first Nike trail shoe, and I was debating between getting another pair of Hoka One One Instincts and the Kiger 4. I decided to give Nike a try and I’m glad I did! I’m reviewing this shoe after logging 247 miles on Rocky Mountain trails and after recently competing in a 50k. This is how the Kiger 4 has performed for me the last couple of months. I’m a forefoot to a midfoot runner and tend to gravitate towards zero-drop to 4mm heel-to-toe drop for my trail running shoes. The Nike Kiger 4 comes in at 4mm with 24mm in the heel and 20mm in the forefoot, exactly what I’m looking for. I’ve had some knee injuries in the past, and I’ve found I do need a little bit of cushion on the trails, but anything beyond 28mm is a bit much for me. The Kiger 4’s shoe height offers the perfect amount of support while maintaining a responsive feel. You can definitely still feel the trail, but it’s a nice balance. The weight comes in at 9.7oz, which is a solid win in my book. Any shoe that’s under 10oz while still maintaining quality and durability stands out in my mind. I’ve had some lighter shoes in the past that broke down too quickly and some chunkier shoes that just made my legs feel heavy. If the Kiger 4 could go a little lighter without sacrificing durability, I’d be an even bigger fan, but I am content with this weight. As far as trail running goes, I’ve yet to find a pair of cooler shoes. My wife has always given me a hard time about Hoka shoes, but she’s raved about the Kiger 4’s design. True, she’s a Nike fan. 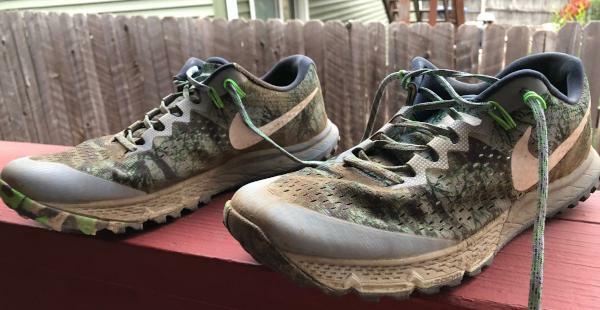 Nike does a fantastic job of taking their awesome designs and transporting them to the trail running scene. The range of colors rocks, too. The color I chose is a little out there, but there’s plenty of casual colors that make for good work and gym shoes, too. I’ve tried a few Hoka One One models and Salomon models in recent years, but no shoe has maintained the consistent quality that I’ve experienced with the Kiger 4. While I’ve taken the shoes through mud, rocks, rivers crossings, and hundreds of miles, it’s hardly broken down at all. As you can see in the photos, there’s been little to no wear and tear to the upper, and the traction/lugs on the sole are still giving me the grip I need, as well. I was a little hesitant about the lug size and pattern when purchasing this shoe, but it’s been a great experience on trails. I’ve gone on a few road runs and have noticed the lugs a little bit (not too big of a surprise), but on the trails, it feels smooth and unnoticeable. The cushioning is still very supportive. Obviously, it’s not the same as for the first 100 miles, but it’s held up much longer than other trails shoes I’ve used recently. I’m still getting the responsiveness I loved from the beginning and the support makes this a go-to shoe day after day. One thing I don’t love about this shoe is the drainage. During my recent 50k, there were multiple water crossings. Unfortunately, my shoes stayed heavy and wet for close to an hour after the water crossings. There was still just a bit of water sloshing around in there which surprised me since I’ve used plenty of other shoes that drained much faster. I’m not even close to retiring this shoe. Most of my shoes last around 400 miles (these Boulder County trails can do damage), but I anticipate using the Kiger 4 for well over 500 miles. This is what initially drove me towards the Kiger 4. I’d heard only good things about the shoe, and then I saw it was under $100 on a number of sites. For the number of miles and the performance I’ve gotten out of the shoe, I’d easily fork out a pretty penny for this shoe again, but I’m grateful I don’t have too! All in all, I’m very satisfied with the Kiger 4 and looking to buy a couple more pairs to stockpile for later years. The Kiger 4 is a fantastic trail shoe. Agile, decently cushioned with a supportive yet comfortable upper it is fun and fast, protective, confidence inspiring and light at 9.5 oz or so. I only wish it was able to handle some road miles with less awkwardness. The Terra Kiger continues to have a great, go-fast, cushioning-to-weight ratio that makes it a joy to run in. The upper of the Terra Kiger 4 features a lot of updates. The shoe has a new and improved Flymesh upper that continues to deliver breathable coverage and lightweight support. The shoe also has a new soft and generous toe bumper, replacing the TPU-made add-on that’s found in its predecessor. It has a thin inner layer that offers a softer feel and it keeps the foot well-protected. Instead of a traditional tongue construction, the 4th version of the Terra Kiger features gusseted tongue design. It stays in place and holds the foot securely. It also comes with an improved Dynamic Fit technology with inner-sleeve construction for a more sock-like fit. The Flywire cables at the top of the shoe were reduced but it still holds the foot comfortably and securely. Lastly, as part of the improved upper construction, the lace system of the shoe is also upgraded with a new lace loop design. The Nike Air Zoom Terra Kiger 4 has a standard running shoe length and is available in a medium width for the men and women’s version. It has a medium fit from the heel to the forefoot area, providing a comfortable fit to runners with medium foot measurements. Just like its predecessor, the 4th version of the Terra Kiger utilizes the Dual Density Outsole that offers protection in high-wear areas and reliable traction on both dry and wet surfaces. The waffle-patterned outsole configuration is strategically designed to provide multi-surface traction and added durability. For an enhanced cushioning, the midsole of the shoe uses the full-length Phylon foam. It offers lightweight and resilient cushioning. The shoe also features the notable Zoom Air unit that consists of pressurized air pockets. It is strategically placed in the heel and forefoot areas for more responsive cushioning. This midsole unit is also present in some Nike shoes, such as the Nike Air Zoom Winflo 5 and Nike Air Zoom Streak 7. The Terra Kiger 4 utilizes an enhanced Flymesh upper material with a seamless construction. It remains thin, airy, and light to provide a breathable coverage and lightweight support. The upper also features the upgraded Dynamic Fit system that is designed for mid-foot support and secure lockdown. Along with the upgrade is the presence of fewer Flywire cables and an inner sleeve construction that aims to deliver a more comfortable and sock-like fit. The shoe also comes with the signature lacing system that’s prominent in many Nike shoes. A new set of lace-loops is supported by the Flywire cables to provide a better foot lockdown. A new gusseted tongue is stitched to the medial side of the upper to prevent it from sliding and to provide an improved fit.